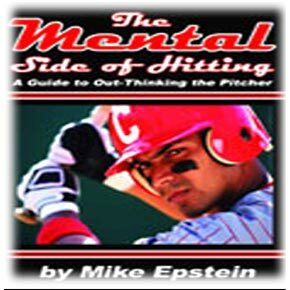 "The Mental Side of Hitting: A Guide to Out-Thinking the Pitcher" takes a unique 100 page look at the special game played between the hitter and the pitcher during each and every at-bat. Epstein's book teaches both baseball and fast pitch softball hitters how to correctly anticipate the right pitch in the right location based on the current game situation. A hitter has only six minutes to make an impact on a game one and a half minutes per at-bat (based on four at-bats per game). By incorporating Epstein's mental concepts into your hitting plan, you can transform mediocre at-bats into run-producing, productive ones. Youve got to make the most of these few precious minutes. This book focuses on the critically important, albeit ignored, mental elements necessary for long term hitting success. Without them, accomplishment at any level of the game is infinitely more challenging than need be.